I do like summer. But whenever the question comes up about which season my favourite season is, I try to change the subject. Winter people are a rare seed! But I stand my ground - I love snow, cold weather, coats, evenings in front of the fireplace, snuggled up with a cup of hot cocoa... The list goes on! Additionally, during the winter I don't feel bad about turning on my oven. Baking while it's 30°C outside seems to be a weird idea to sime people. Not to me! I can't possibly go a while month without baking. As much as I love "No Bake" desserts, I also love something that just came hot out of the oven, not cold out of the fridge. It's just not the same. And sometimes I need the full load of chocolate. And this is what these cookies are: chocolate overload. 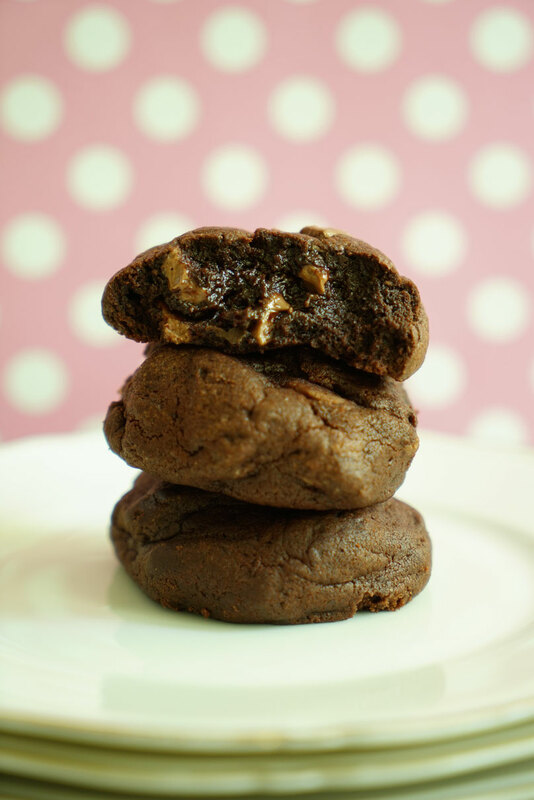 Calling them cookies almost doesn't do them justice, as they taste like a mix between a dense brownie and a soft cookie. This cookie is neither crumbly nor dry. I discovered the recipe through a british blogger but I changed parts of it. I reduced the amount of sugar as I felt like the sweet taste overpowered everything else. I replaced some of the white sugar with brown sugar, raised the amount of chocolate and reduced the oven time. 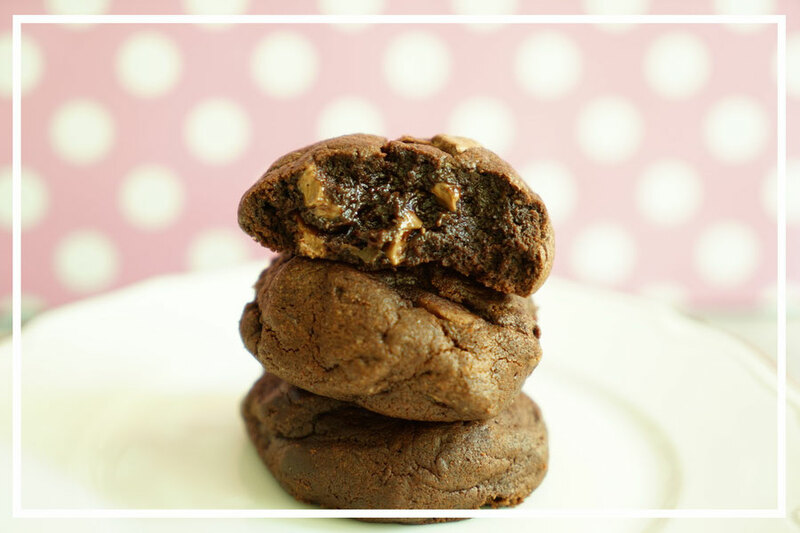 There's not much left to say, make these cookies, they are amazing and easy and delicious and you will be so glad you did! This is definitely one of my favourite recipes ever. Cream the butter with the two kinds of sugar until creamy and light. Mix in the eggs one by one until fully incorporated. In a separate bowl, whisk together the flour, the baking powder, the salt and the cocoa and sieve it over the egg and butter mixture. Whisk everything together until combined, but do not overmix. If the dough is too crumbly (it should come together but it should neither be too wet nor should it form a ball), use some of the milk to make it creamy. Chop the chocolate and the nuts and fold them in. Use your hands to form little balls, about the size of a golfball. If you prefer to make them bigger or smaller, all you need is adjust the baking time accordingly. Line the baking sheet with baking paper and arrange the cookie balls on the tray with enough space for them to spread. Bake them for 11 minutes. If you like them really undercooked (like I do), bake them for 10 minutes. You can freeze the dough balls and bake them frozen, however the baking time should be about 15 minutes.